IN JUST TWO weeks’ time over 1,000 emergency services personnel will march down the centre of Dublin city. Over the course of the year, some of these services have suffered tragedy while others weathered controversy. The annual Frontline Emergency and Security Services Eire Forum (Fessef) parade is a celebration of the important work the people on the frontline do every day and a chance for them to thank the public for their support. 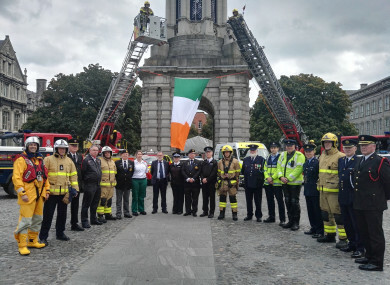 Actvities will take place over the weekend of 8 September, with the main event – a parade of emergency vehicles and personnel – taking place at midday on Saturday 9 September from Parnell Square. It will pass through O’Connell Street, over the bridge and into Trinity College, where there will be a number of displays and demonstrations by services until 4pm. Chief Superintendent Kevin Gralton, who is on the board of Fessef, said the event is “gaining in momentum every year”. “Frontline workers are out there to serve the public and that’s what we do as an organisation – always have and always will – and that’s what all the other services do as well. Days like this are always very positive because it creates more interagency activity and cooperation and it fosters one-to-one relationships when required,” he said. This year, Fessef has added an event to the weekend with a concert at the Pro-Cathedral, the evening before the parade. A musical tribute will be paid to those members who have given their lives in the line of duty and in particular those who have died in recent times, including the crew of Coast Guard helicopter R116, Catriona Lucas. Garda Tony Golden and Garda Adrian Donohoe. There will be performances from the Garda Band, the National Ambulance Service pipe bang, Dublin Fire Brigade’s pipe band, Midlands Prison choir and more. A section of RTÉ’s philharmonic choir will also perform. Chief Superintendent Gralton said the concert will be a “spectacular event” and all proceeds from the tickets, which are €35 each, will go to three charities – One, Bumbleance and the RNLI. Tickets for the concert on 8 September are available from the Pro Cathedral and on the Fessef website. Email “'We're there to serve the public': Frontline emergency parade to highlight positive work of services”. Feedback on “'We're there to serve the public': Frontline emergency parade to highlight positive work of services”.